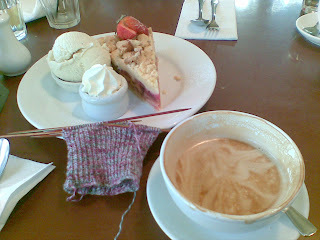 There hasn't been much knitting in these posts lately and that's partly because of my recent increased workload and partly due to a lack of knitting mojo. I decided that I wouldn't be disheartened by the ever present pile of UFO's and have embarked on a totally new project - Socks! This is a whole new world for me as I have never had any desire to cross to the other side - I've heard that it is totally addictive and once entered you can never leave. Last weekend - just before Mother's day I dug through my pile of yarn and found a ball of Tofutsies I had won at the Sydney Summer WWKIP. Recent experience with the Stig made me very proficient with a set of DPN so the smooth silky Knitpick Harmonies were a joy to hold. I originally had ideas of creating a complex lace pair but the fact that my short term memory is worse than a goldfish meant I wisely opted for a very basic Patons rib pattern. No frills, no challenges - just get the thing finished. They got their first outing at Lindsay's cafe in Faulconbridge on Saturday morning. 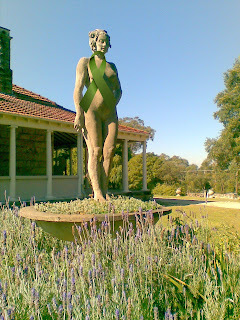 We had just finished putting up a small lighting rig at the local High School for a forthcoming dance piece and happened upon this very nice restaurant a the Norman Lindsay Gallery and Museum. It was sort of a pre Mother's day treat and was one of the rare occaisions that we were together as a family so we made the most of it. The food and service were good in parts, the lamb shanks were delicious, the barramundi a bit dry, and the apple and rhubarb crumble didn't live up to its promise but the setting in the little studio cottage was perfect, as was the big bowl of Latte. The sock has progressed and is almost at the heel - I know that this has been a challenge to sock newbies before but after the Stig - nothing fazes me. welcome to the land of socks! Once you put them on your feet you'll know why it's addictive!! I'm pleased you're doing socks. For me, the appeal is the measurable progress; first reaching the heel, then turning it, then completing the first sock, then repeating. I like milestones. The next challenge is when and with what to wear them!